Turkey ▸ Fethiye ▸ Fethiye Eating & Drinking ▸ Zentara Beach & Kitchen – Chilling …And Eating! Zentara Beach & Kitchen – Chilling …And Eating! Zentara Beach And Kitchen is in an area that forces us to reminisce. “I remember when all this was fields.” That kind of saying that parents used to say. We’re a good few years into our life in Fethiye and a lot has changed. In the case of Koca Çalış, we swap the word, ‘fields.’ “I remember when all this was reeds,” is the phrase that bursts forth each time we follow the beach road to that area. I almost cut myself short when I’m thinking it. It feels like concrete evidence that you’re getting old and hankering after some idyllic, romantic past. Hmm, maybe that’s what happens when you reach your 40s? But it’s easy to think in this way because the Fethiye area changes so quickly. Where once there was a building or an empty space, something new can pop up in its place almost overnight. All of a sudden, a bit of wilderness can become a whole new neighbourhood – or a beach. And so Koca Çalış; that lonely beautiful place where we used to go with friends in the car. Wheel spinning and juddering over the pebbly beach (there was no road to speak of) with the aim of barbecuing on Karataş Beach or sitting ourselves down at the one and only beach shack along that stretch. Occasionally, in winter months, we would have to turn back because the track had become a pond and we couldn’t get through. That little stretch is now a growing neighbourhood. Holiday homes and the all inclusive Jiva Beach Resort. There’s a tarmacked pedestrianised road that follows the beach. And, along the back, a new road carries the dolmuş and the council buses. The lonely wilderness is no more. Never fear, dear reader. We’re not hurtling uncontrollably down the path of doom and gloom, here. Nah, we’re merely setting the stage of telling you that things are a tad different in these parts now. Should you get on any of the Fethiye to Çalış dolmuşes or council buses, the last stop is now Surf Cafe. Surf Cafe – or ‘Children of The Wind,’ as their board said in those days – has been around for an age (relatively speaking). The beach shack we mentioned before was what used to be Birlik. That’s now Mekan. By and by, as more people moved to the area, a few more beach restaurants came and went and some have changed ownership and identity a few times. Guess that’s what happens with all things new. On the beach-restaurant-front, Koca Çalış was finding its feet. It’s still finding its feet, but slowly, slowly, it’s getting there. In a good way. Zentara Beach & Kitchen is a part of that beach restaurant scene. We do love this area – well, we’ve got barbecue history around here, haven’t we – but it’s also the view of the whole stretch of Çalış Beach, gently curving towards, and leading your eye towards, Fethiye’s Karagözler and the ever present Babadağ in the distance. The angles just work and it’s a view you can’t tire of. When conditions allow, you can also admire the skills of the local kitesurfers, too. Zentara Beach & Kitchen is our little favourite place from which to take in those views. As with many of our posts, these photos were not all taken on the same day on a one-off visit. They’re a little collection of the what we’ve taken over the months and years. 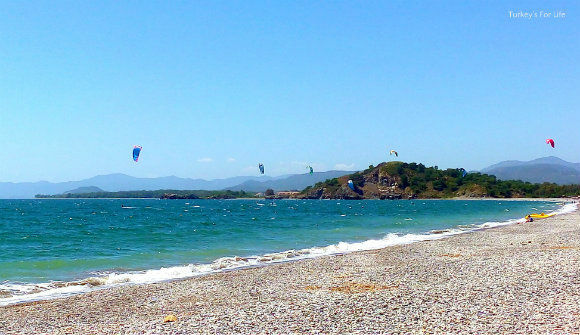 In the hot Fethiye summer, a jump on the Çalış dolmuş to the last stop, and then a short stroll to an almost-guaranteed breezy beach – well, these two non-beachy people quite like it down here at Zentara Beach & Kitchen. Is that an age thing, too? What were boring beaches are now happy havens? 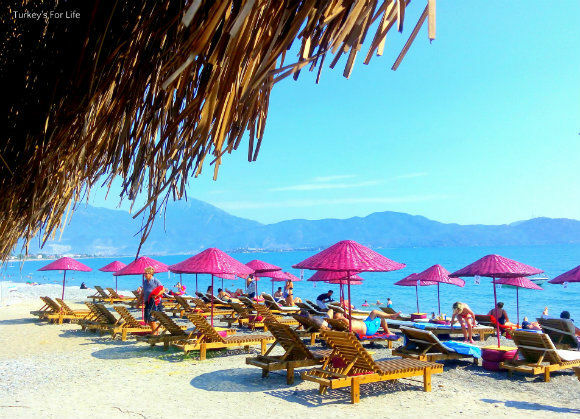 Lazing the summer days away at places like Zentara Beach or Help Beach in Fethiye. Yes, more of the same, please! Anyway, back to Zentara Beach & Kitchen – why has it hooked us a tad? I mentioned in our green lentil salad recipe post that we’re on a bit of a summer fitness kick. We do this every summer. When you’ve been out for a little run in the early morning Fethiye coolness, the day after that run feels like reward day. It’s a bit of cross training, too. Often, we’ll walk to Zentara Beach. 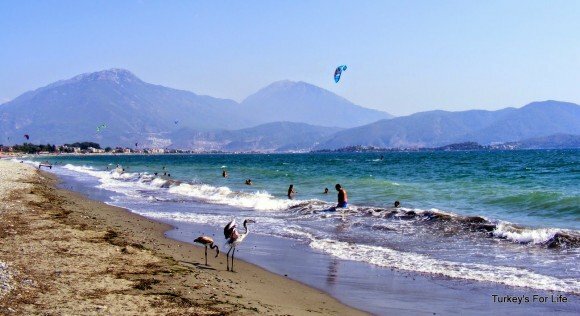 A bit of a swim and, rather than jump back on the dolmuş at the final stop, we amble back along Çalış Beach, too. The name helps, too. Zentara – it just says ‘relaxing,’ to us. The fronds surrounding the köşks, bar and restaurant, swishing and rustling in the Koca Çalış breezes. It’s what summer days are all about. There’s a large, tree-shaded area as you go through the entrance, with comfy corner benches and tables. We don’t often sit there because it’s just the two of us. A previous green and orange colour scheme has given way to both bright and muted colours. It’s all very smart in a very beachy, chilled out way. But we did say going to Zentara Beach & Kitchen is like reward day after our running exploits. Hmm, yes, well, they have a very tempting menu. As well as being famous for their Turkish village breakfast, they have a menu that’s full of salads, pastas and pide, amongst other dishes. They have a great sandwich and burger selection, too. We’ve strayed once or twice and had pasta, traditional mantı or pide (all very nice, I might add). But if you just sit and watch for a while as the waiting staff bring out food, you would be forgiven for thinking that burgers and sandwiches were the only things on the menu. Yeah, so you see, it’s not just for cross training and sunbathing that we head to Zentara Beach & Kitchen. We’ll hold our hands up and admit that the occasional burger indulgence is also a draw. Oh, and we have a beer with that burger, too. Well, it’s okay; we’re running again the day after. Beaches never stay the same and beds and umbrellas are upgraded every now and then. Where once there were the natural-look umbrella covers that you can see in the older photos above, these are now sprayed in fuschia pink. And we love them. Well, we all love a bit of colour in our lives don’t we. Zentara Beach & Kitchen is in Koca Çalış. To get there by dolmuş, take either the Sahilden or the Günlükbaşı dolmuş as far as the last stop in Çalış, get off and continue along the same road, on foot, for around 5-10 minutes. If you are going by car, there is a good-sized car park at the entrance. Entrance and sunbeds at Zentara Beach & Kitchen are free. There are showers and changing cabins if you want to change after swimming. Zentara is a great place to watch the famous Çalış sunset from. 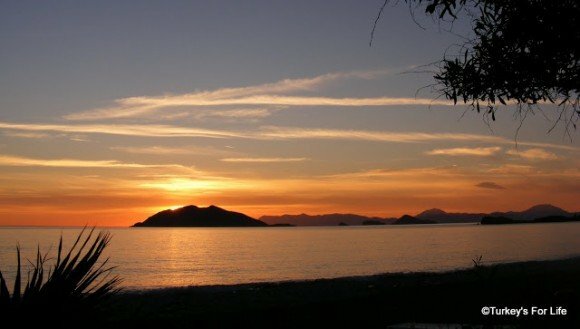 Watching a Çalış sunset is a must do in Fethiye, for us. To keep up with what’s going on at Zentara Beach & Kitchen, you can like their Facebook page and follow them on Instagram. And if you want other ideas about beach restaurants, bars and other eateries around the Fethiye area, here’s our growing list of suggestions. The sunshades down your way have very distinctive hair styles. Yes, we’re very classy in these parts, BacktoBodrum. 🙂 These at Zentara really do the trick, actually. Make you feel cooler on a hot day.